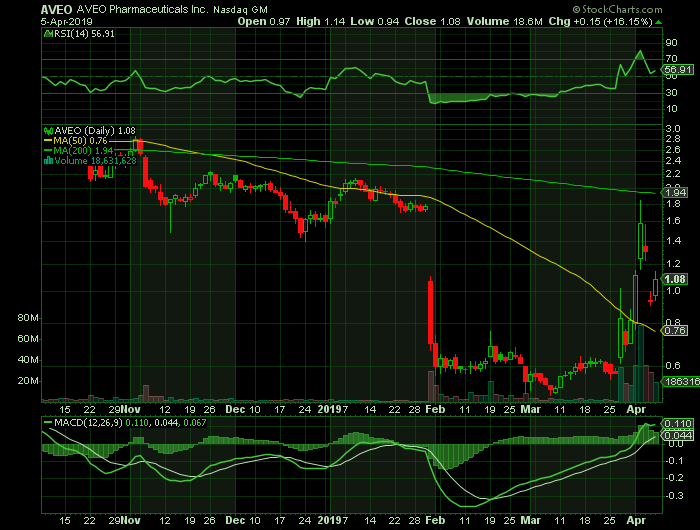 AVEO Pharmaceuticals, Inc. (NASDAQ: AVEO) is a biopharmaceutical company, develops and commercializes a portfolio of targeted medicines for oncology and other areas of unmet medical need. 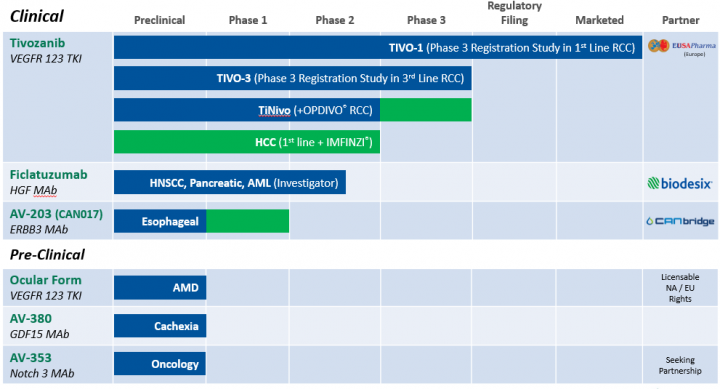 It markets its lead candidate, tivozanib, an oral, once-daily, vascular endothelial growth factor receptor tyrosine kinase inhibitor, which is used for the treatment of renal cell carcinoma (RCC). On April 3rd, 2019, the company announced it has commenced an underwritten public offering of its shares of common stock, together with warrants to purchase shares of common stock. The proposed offering is subject to market and other conditions, and there can be no assurance as to whether or when the offering may be completed, or as to the actual size or terms of the offering. On April 1st, the company along with partner Biodesix, Inc. announced positive results from phase Ib expansion cohort of ficlatuzumab in combination with cytarabine in patients with relapsed and refractory acute myeloid leukemia (AML). The phase Ib study was designed to assess the safety, tolerability and preliminary efficacy of ficlatuzumab combined with cytarabine in AML patients who are refractory to first-line therapy (7+3) or have relapsed within one year of induction, a population known to have poor outcomes. In December 2015, AVEO entered into a license agreement with EUSA Pharma, following which the former granted exclusive right to develop, manufacture and commercialize Fotivda in Europe to EUSA. AVEO receives milestone payments and royalties on Fotivda sales in Europe. Last November, AVEO announced that it will earn a $2-million milestone fee from EUSA Pharma, triggered by the commercial launch and reimbursement of Fotivda in Germany. Entered Immuno-Oncology Clinical Supply Agreement with AstraZeneca. In December 2018, AVEO entered into a clinical supply agreement with AstraZeneca to evaluate the safety and efficacy of AstraZeneca’s IMFINZI® (durvalumab), a human monoclonal antibody directed against programmed death-ligand 1 (PD-L1), in combination with tivozanib in first-line hepatocellular carcinoma, or liver cancer, in a Phase 1/2 study. AVEO will serve as the study sponsor; each party will contribute the clinical supply of its study drug and study costs will be otherwise shared equally. The Phase 1 portion of the study is expected to commence this year. Earned $2 Million Milestone Payment from EUSA Pharma. In November 2018, AVEO announced the triggering of a $2 million milestone payment from EUSA Pharma related to the reimbursement in Germany for FOTIVDA® as a first line treatment of adult patients with advanced RCC. AVEO believes that its $24.4 million in cash, cash equivalents, and marketable securities at the end of 2018, together with the additional $7.5 million raised from sales under its sales agreement with SVB Leerink in February 2019 and together with the extension of the interest-only period under the Hercules loan agreement, which results in deferment of principal payments, would allow it to fund planned operations into the first quarter of 2020. Continuing positive results from clinical trials could act as a catalyst for company shares. They will require substantial additional funding, and a failure to obtain this necessary capital when needed would force us to delay, limit, reduce or terminate research, product development or commercialization efforts. In the near term, they are substantially dependent on the success of tivozanib. Their preclinical or clinical trials of any product candidates that they or their collaborators may develop could fail to demonstrate satisfactory safety and efficacy to the FDA and other regulators.